A shotgun wedding…or a Match Made in Haven? By–the–book attorney Katelyn Gilmore has her entire life mapped out. But a spontaneous weekend of passion with Reid Davidson upends that well–ordered universe. She's going to have a baby! 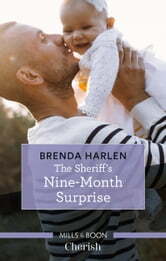 And what's more, her hunky fling's now the new sheriff in town… literally. Reid's taking his dad–to–be duties seriously and won't rest until Katelyn has a ring on her finger. Sure, the baby's the most important thing, but what about true love?